US-based linear ad-supported OTT TV service Pluto TV is to launch in Germany, Austria and Switzerland in the near future, following its launch in the UK on the Now TV platform and Roku devices at the beginning of October. 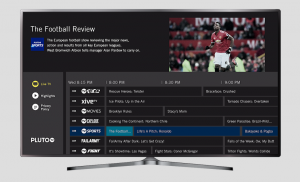 Speaking at the OTT TV World Summit in London, Olivier Jollet, managing director, Europe, Pluto TV, said that the service, which operates in the US with 100 wholly-owned live channels and claims 10 million users, would launch in the new markets shortly. Jollet said that Pluto has created “a mass market product” in the US by aggregating niche audiences for specific types of content. “We don’t need to have a massive audience on any one particular channel,” he said. Jollet admitted that Pluto would face different challenges in Europe, with its strong free-to-air offering and low-cost pay TV services than in the US, where pay TV is more expensive and cord cutting is more developed. He said that in Europe, creating a localised offering would be key., something he said the company had already done in the UK. “We need to adapt that. There is no cord-cutter model in Europe so that is where marketing is slightly different. The market approach will be very local and we are taking a different approach,” he said. Pluto TV’s core proposition in the US is to aggregate content form over 150 licensors including the big US studios as well as niche content providers. “We don’t care where the content is coming from. We can mix digital-first content with content produced for theatrical release in the same hour,” he said. Users can download the Pluto TV app and immediately start enjoying the ad-supported content on the platform, signing up later, said Jollet. While Pluto doesn’t have an obligatory log-in, it provides incentives for people to sign up. Viewers see traditional ad breaks that are nevertheless personalised for each user. In Europe, the user experience will be slightly different because of the constraints of GDPR data legislation, he admitted. Jollet said that people love to find content they know on the service, and stay with it for “a very long time”. “Our ambition was to bring a lean-back product to the OTT world,” he said. Jollet said that TV remains the best medium for brand awareness campaigns. “We are creating an inventory that has high value for advertisers,” he said. By aggregating channels into an ad-supported business, Pluto creates a new opportunity for advertisers, he said. Jollet said that Pluto is also working with advertisers on new creative concepts such as long-form advertising. “We are flexible…and that’s what advertisers like,” he said. He said the company aimed to maximise distribution by being on all possible devices and has also started to distribute its channels outside it application, for example on Samsung Smart TVs in the US.